We are honored to organize a panel within the Eurosfat event, on April 7 from 14:00 called “Escaping Europe’s periphery. Balancing domestic growth and trade”. As the Ukrainian crisis showed us, the periphery of Europe is a dynamic but also unstable area. For the EU Member States that are not yet part of the euro area and are still behind in economic terms, it is vital that their economic policies ensure both nominal convergence with the major economies of the EU, but also to develop a distinct and important position in the global role of the EU. For registration go here. There are two main ways available to get resolve the problem of the periphery: improving domestic economic governance and the overall competitiveness of the economies of Eastern EU and taking those significant economic decisions that can provide them with an important role in EU trade , both internally and externally. The next European Parliament will have an important role in influencing both solutions. 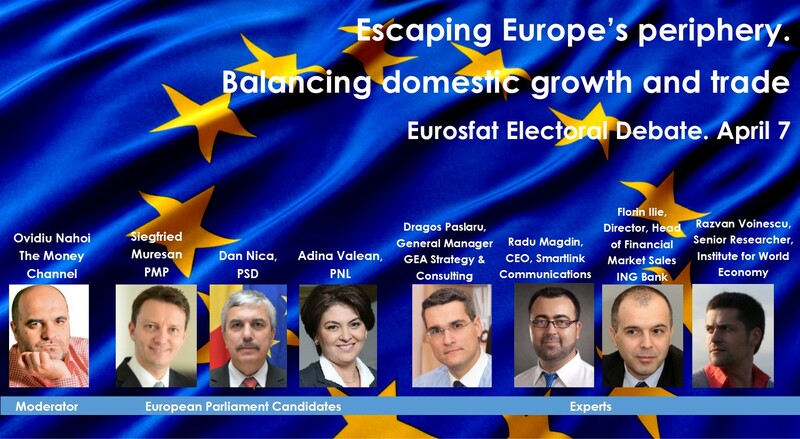 This workshop aims to offer an opportunity for some of the main candidates to the European Parliament elections to present their solutions to some of these problems. During the debate, candidates will receive questions from the invited experts and also from the public and the media. We aim to also find answers on how Romania can use its economic geography to play an important role as a gateway between the East and the West on the New Silk Road, and to ensure a stable domestic prosperity.